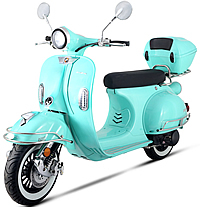 Retro style with modern technology is just a right scooter for you. 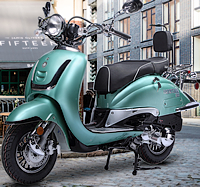 The brand new ZNEN F10-150 scooter captures the essence of Italy's Vespa & Lambretta. 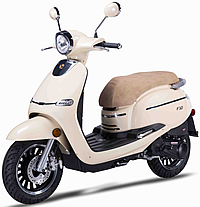 Elegant curves to make the most humble of men blush! 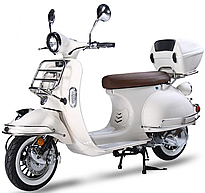 Combines unique chrome details and the latest technology. 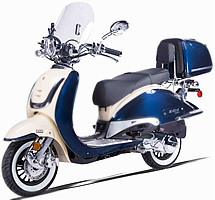 It comes with Dual disc brakes, Remote start, Anti-theft security alarm system, LED light, 12" tires, Chrome/black wheels, Fancy spokes... 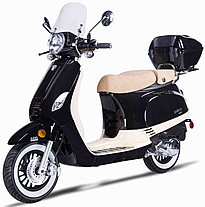 Shipped near fully assembled, just put on mirrors, charge battery, gas it up and you are ready to go! 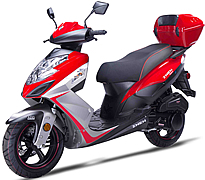 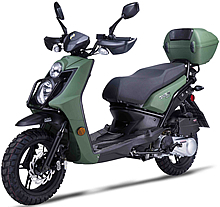 The brand new ZNEN 150cc VES 150 scooter combines unique and retro body style and the latest technology. 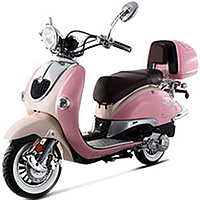 It has the most popular Vespa body design and beautiful chrome details, comes with remote start and anti-theft security alarm system, folding front rack, detachable rear trunk, LED light, aluminum wheels with white wall tires, fancy spokes... Comes to your door near fully assembled, just put on mirrors, charge battery, gas it up and you are ready to go!